Here is a chance to own a private estate located in the private and secure community of Fina Tranquila. This community rests on over 120 acres of rolling hills where there is plenty of land to ride horses, ATV’s or just hiking. There is 24/7 security with a full time gardener as well. The house itself is a new construction and never lived in. Sitting on 19,457 M2 or over 5 acres, this 3000 sq ft, 3 bedroom, 4 bathroom with a detached 1000 sq ft pool house is an exceptional value. The pool is 5×13 meters. 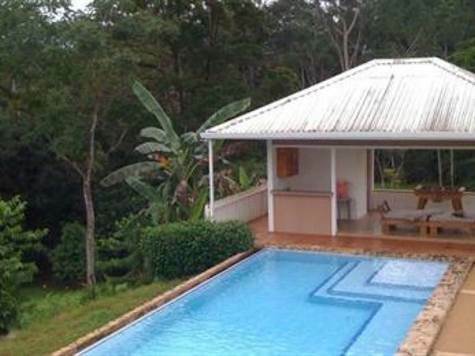 The development is a short drive east from Quepos and Manuel Antonio on the foothills located in Naranjito Excellent owner finance is available and owner is very flexible on terms.